Eating a plant-based, whole food diet doesn’t mean you need to give up sweet treats. Feed your soul and your body with these vegan, low-sugar and very fudgy tamarind and cacao truffles. With spices such as cardamom, ginger and sweet-hot guajillo pepper, your tongue will soon be dancing. I was at one of my favourite shops yesterday on a fruitless foray to load up on some good ol’ American grits. Yeah, they aren’t whole food, but whatever. Sometimes you just need a simple taste of home. And since my true home is the Deep South, grits are in my DNA. They are also my go-to when I want a little white-carb comfort. Usually I tuck a bag in my luggage for my trip back to the UK, but I didn’t this time. For some reason I had about 4 new pairs of yoga pants, despite not doing yoga, but not my favourite way to enjoy proper butter. Unfortunately, the UK’s best Mexican deli, Lupe Pintos (handily located in Edinburgh, and now Glasgow), doesn’t stock them. No one does as they are sooo heavy and therefore sooo expensive. If you are used to paying about $3 a bag, £10 ($15) is a bit steep. Anyway…to assuage my disappointment I sampled some of the deli’s proper Mexican hot sauces and ended up buying some, as well as a few jars of Cumbria-made Mr Vikkis chutneys (tamarind and chipotle chutney is divine) and some various flimsy packets of Mexican chile pepper powders. As soon as I got home I opened the tamarind chutney and dipped a teaspoon in the deep brown goo. Bliss: sweet, hot, sharp, spicy. Perfectly balanced. Then I looked at my spices and thought, “would it be so crazy to make tamarind and chilli truffles?” Then, basically I set about rummaging in my haphazard bulk buys food stash for raw cashews and deglet nour dates, then corralled a selection of warm spices on my countertop: ground ginger, cardamom, cinnamon, guajillo chile powder (you could use cayenne or chipotle) and vanilla seeds. After soaking the nuts and dates I gradually began sprinkling in the spices and spooning in the tamarind paste to the bowl of my food processor until I achieved the right taste and texture balance. Scraping it all down and pulsing some more to get a stiff, barely sticky dough. I then wondered if I added an egg and some baking soda could I make it into a cake. But that did seem crazy. Abandoning that whim I let the mix settle in to perfect scooping texture before pinching small pieces and rolling them up. I then made up a cacao-led spice coating mix and rolled them in this, too. You could go a bit fancy and dip the buck-naked spheres (balls sounds too rude) into melted chocolate, cooling and then rolling in the spice mix or pressing them into cacao nibs. I’m the opposite of fancy. Whatever that is. These truffles are truly a whole food treat. Just the tiniest hint of tamarind and then one, two, three, the spices roll across your tongue in succession until you feel the gentle heat of the sweet guajillo. Instead of paying a king’s ransom on some set menu in a stuffy restaurant this Valentine’s Day, why not get some fruity beers or some cheap rosé and nibble these in front of Netflix? Preceded by a pizza, natch. Yeah, I’m a cheap date. 1. Soak the cashews and dates in just boiled water for half an hour, then drain well and add to the bowl of a food processor. 2. Sift together the spices and cacao and add to the processor bowl, along with a pinch of salt. 3. Melt the chocolate over a double boiler or bain marie then pour into the mix, with the tamarind paste. 4. Pulse the ingredients for a few seconds then fully, until the mix is like a dough. Taste and adjust to your liking – maybe more dates or cardamom. The flavour will intensify as it settles and cools. Let it sit in a cool room for half an hour, or in the refrigerator if your home is warm, or it’s summer (lucky you!). 5. Sift the spice dust into a wide shallow bowl or onto a tray. Pinch pieces of the “dough” off (a small, whole walnut size) and roll into a balls, gently rolling in the cacao-spice dust to finish them. Pop in a lidded container and refrigerate. These will keep for about a week. Wow what a journey! From the deep south of America to Cumbria. I’m glad the risk of experimenting payed off, the truffles look great. Whaaat?! Kellie, you had me at tamarind. Would have never thought to put tamarind in truffles, but it makes sense the tart contrast with overly sweet dates. I absolutely love this idea. But tell me more about the imported brands being more tart? Looks amazing! Sweet and salty snacks are my fave. Valentines night sorted!!! Brilliant flavour combinations. Awesome ! Intrigued by your choice of ingredients !! These sound lovely, Kellie! And incredibly, I have all of the ingredients on hand to make these (if I sub chipotle powder, that is). Pinned, shared, and will be enjoyed soon, thank you very much! So delicious looking. A nice treat! Looking around your fridge amounted to such a beautiful and decadent recipe that is also healthy! 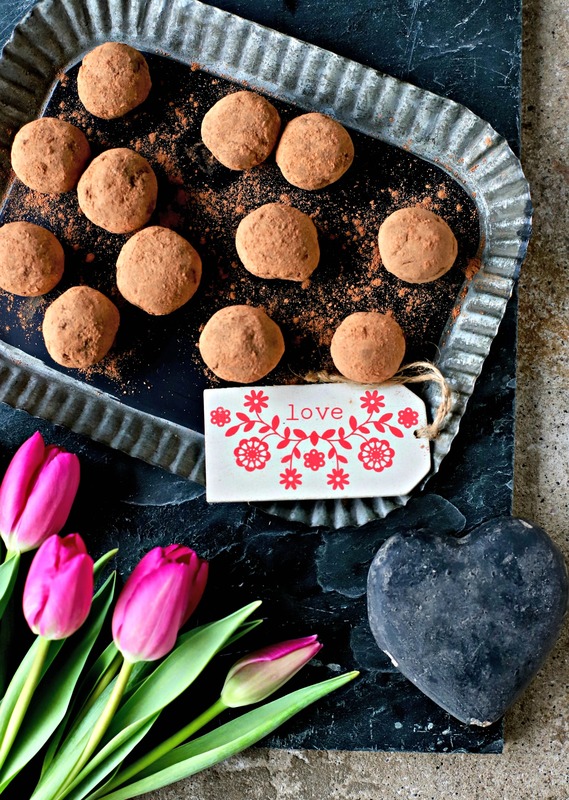 These truffles would be so perfect for Valentine’s Day!